Adult coloring books are very much in vogue these days as a means to relax and rejuvenate. 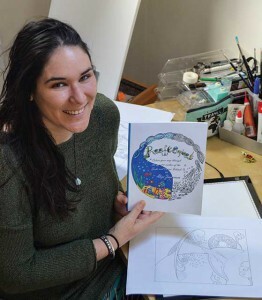 Alizee Zimmermann is a young artist from the Turks & Caicos Islands who is using her new coloring book Reefscapes to spotlight the unique underwater landscapes of the Turks & Caicos Islands — with the hopes of increasing awareness of the need for ocean conservation. Alizee Zimmermann with her new coloring book, Reefscapes. When Alizee was 17, she started a four year program in English Literature at the University of Edinburgh, spent her third year as an exchange student in Spain, and graduated with a Masters of Arts in 2008. Happily returning home after six years in the UK, Alizee says she wanted nothing more than to be a bartender (to her mother’s great dismay). She held a trio of part-time jobs at Jimmy’s Dive Bar, Undersea Explorer (semi-submarine), and on the Atabeyra sailboat. Soon afterwards, she managed the Discovery Centre in Club Med and guided tours for French and Spanish groups. In 2011, Alizee went to China to teach English as a foreign language, after taking an online TEFL course. There she taught at a high-school in a small town (about six million people!) in Hubei province, later moving to Chengdu in Sichuan province to teach at the university. After two years in China, Alizee was longing to be warm and near the ocean again! With her boyfriend Justin, Alizee moved to Vietnam, where she completed an internship program with Rainbow Divers and worked her way up from Rescue Diver to Instructor. She was offered a job on the Turks & Caicos Aggressor, so came home and spent six months working as a dive instructor and videographer on the liveaboard, often on the Silver Banks swimming with humpbacks, amassing more underwater memories that served to inspire the coloring book. Reefscapes was well-received at the TCI Arts & Crafts Expo 2015 and several hotels, including Amanyara, The Palms, The Sands, and Blue Haven, have all picked up the book either as gifts for repeat/special guests or for the boutique. The coloring books are also sold in Anna’s Gallery, Dive Provo, Driftwood Studios, and Marco Travel, and available online through CreateSpace and Amazon. For more information or to order a copy of the coloring book, visit www.tradewindcolours.com. Alizee recommends placing a sheet of paper between pages if using paints or markers to avoid bleed-through.